Jerome, born in Dalmatia, A.D. 329, was sent to school at Rome. His boyhood was not free from fault. His thirst for knowledge was excessive, and his love of books a passion. He had studied under the best masters, visited foreign cities, and devoted himself to the pursuit of science. 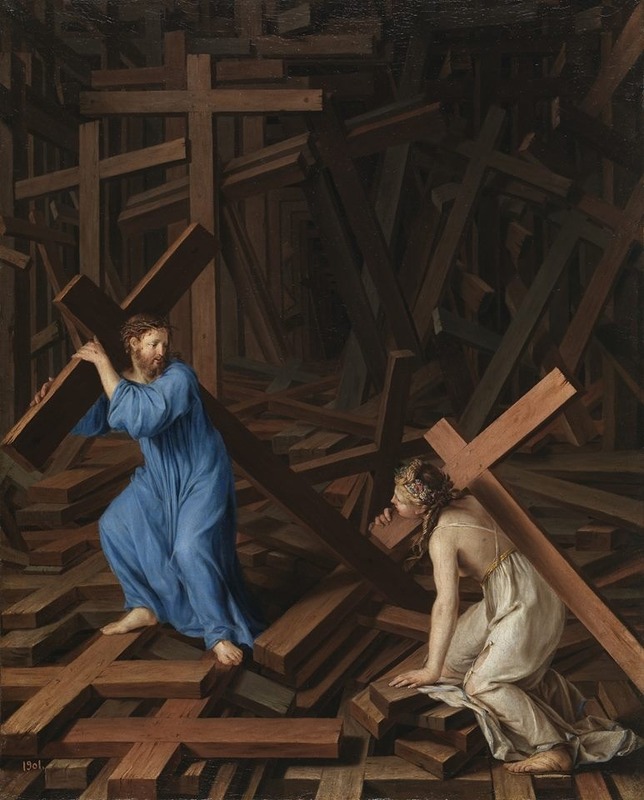 But Christ had need of his strong will and active intellect for the service of His Church. 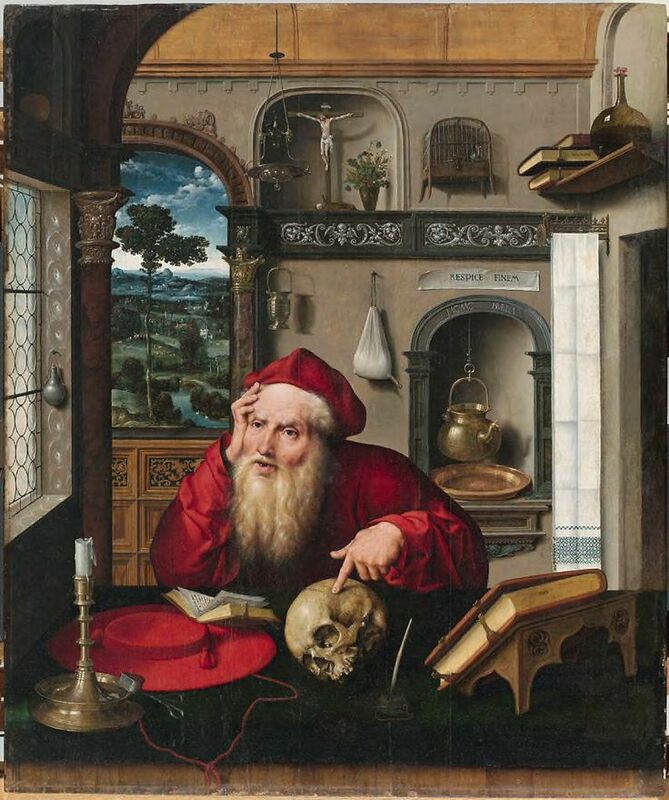 St. Jerome felt and obeyed the call, made a vow of celibacy, ﬂed from Rome to solitude, penance, and prayer a new lesson of divine wisdom. This was his novitiate. The Pope soon summoned him to Rome, and there put upon the now famous Hebrew scholar the task of revising the Latin Bible, which was to be his noblest work. Retiring thence to his beloved Bethlehem, the eloquent hermit poured forth from his solitary cell for thirty years a stream of luminous writings upon the Christian world. 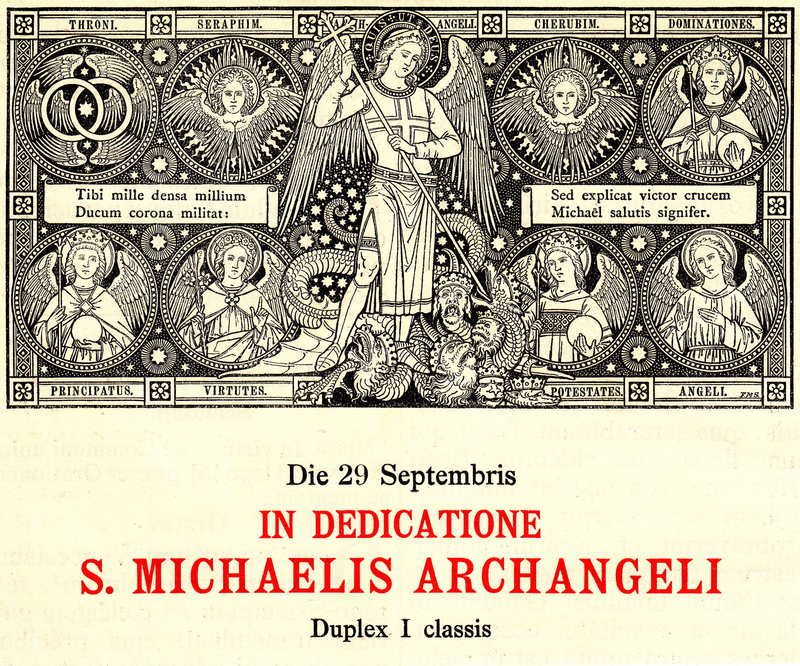 In medio Ecclesiae aperuit os ejus: et implevit eum Dominus epiritu sapientiae, et intellectus: stolam gloriae induit eum. Ps. 91: 2 Bonum est confiteri Domino: et psallere nomini tuo, Altissime. Gloria Patri et Filio et Spiritui Sancti sicut erat in principio et nunc, et semper, et saecula saeculorum. Amen. In the midst of the Church the Lord opened his mouth: and filled him with the spirit of wisdom and understanding: He clothed him with a robe of glory. Ps. 91: 2 It is good to give praise to the Lord: and to sing to Thy Name, O Most High. Glory be to the Father and to the Son and to the Holy Ghost, as it was in the beginning, is now and ever shall be, world without end. Amen. Dearly beloved, I charge thee before God and Jesus Christ, Who shall judge the living and the dead, by His coming, and His Kingdom. Preach the word: be instant in season: reprove, entreat, rebuke in all patience, and doctrine. For there shall be a time, when they will not endure sound doctrine; but according to their own desires they will heap to themselves teachers, having itching ears, and will indeed turn away their hearing from the truth, but will be turned unto fables. But be thou vigilant, labor in all things, do the work of an evangelist, fulfill thy ministry. Be sober. For I am even now ready to be sacrificed; and the time of my dissolution is at hand. I have fought a good fight, I have finished my course, I have kept the Faith. As to the rest, there is laid up for me a crown of justice, which the Lord, the just Judge, will render to me in that day; and not only to me, but to them also that love His coming. 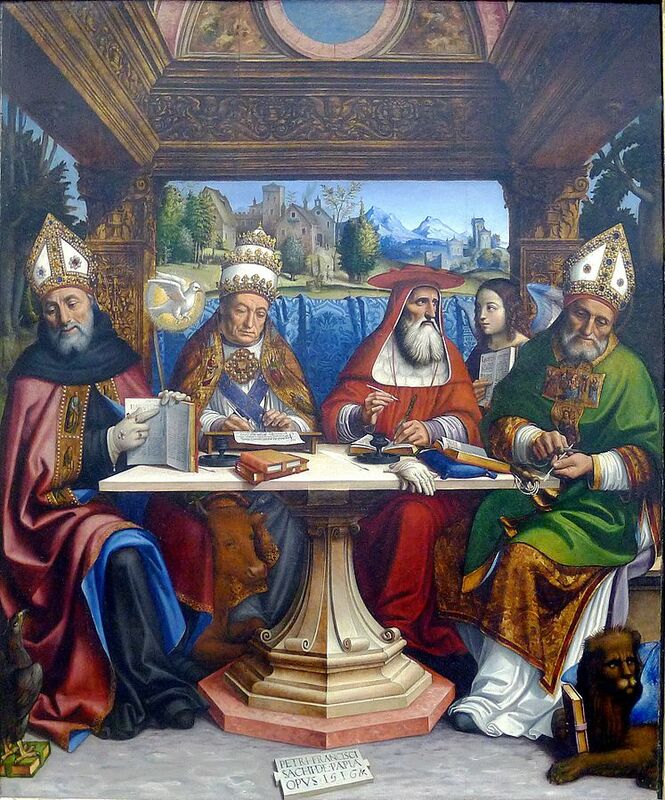 Four doctors of the Church St. Augustine, St. Gregory the Great, St. Jerome and St. Ambrose. The mouth of the just man shall meditate wisdom, and his tongue shall speak judgment. The law of his God is in his heart; and his steps shall not be supplanted. Alleluia, alleluia. The Lord loved him and adorned him: he clothed with a robe of glory. Alleluia. By Thy heavenly gifts, O Lord, grant us, we pray, to serve Thee with untrammeled minds, that the offerings we bring may, by the intercession of blessed Jerome, Thy confessor, effect our healing and our glory. Through our Lord Jesus Christ, Thy Son, Who liveth and reigneth with Thee in the unity of the Holy Ghost, one God. 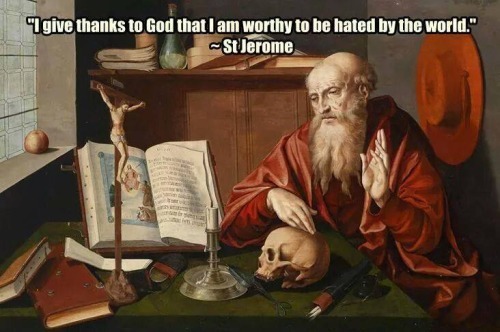 Filled with Heavenly nourishment, we pray Thee, O Lord, that by the intercession of blessed Jerome, Thy confessor, we may be found worthy to obtain the favor of Thy mercy. Through our Lord Jesus Christ, Thy Son, Who liveth and reigneth with Thee in the unity of the Holy Ghost, one God. Benedícite Dóminum, omnes Angeli ejus: poténtes virtúte, qui fácitis verbum ejus, ad audiéndam vocem sermónem ejus. Ps.103: 1 Bénedic, ánima mea, Dómino: et ómnia, quæ intra me sunt, nómini sancto ejus. v. Gloria Patri et Filio et Spiritui Sancti sicut erat in principio et nunc, et semper, et saecula saeculorum. Amen. Bless the Lord, all ye His angels: you that are mighty in strength, and execute His word, hearkening to the voice of His orders. Ps. 103:1 Bless the Lord, O my soul: and let all that is within me bless His holy name. Glory be to the Father and to the Son and to the Holy Ghost, as it was in the beginning, is now and ever shall be, world without end. Amen. 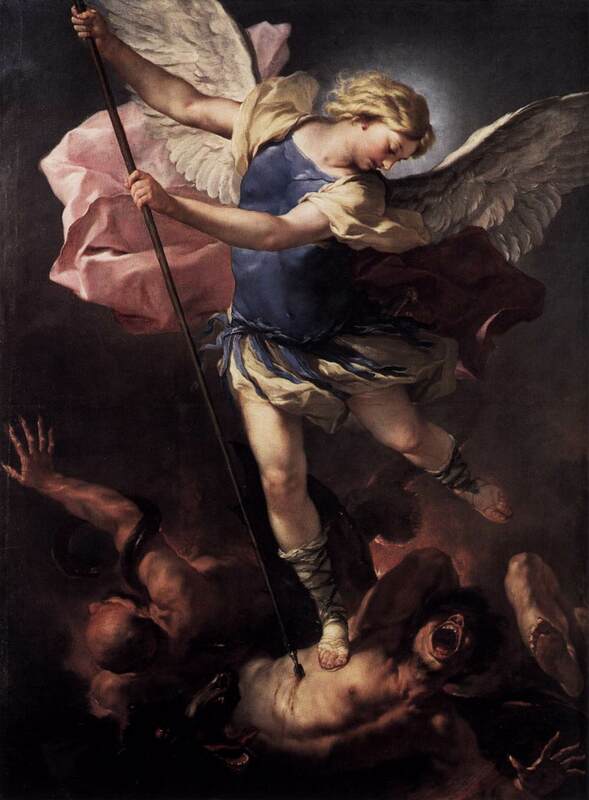 O God, Who dost in wonderful order dispose the ministries of angels and men, mercifully grant that our lives be fortified by those who continually stand in Thy presence and minister before Thee in heaven. Through the same Jesus Christ, Thy Son, Who liveth and reigneth with Thee in the unity of the Holy Ghost, God. 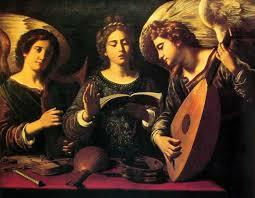 Bless the Lord all ye His angels: you that are mighty in strength, that do His will. O my soul, bless thou the Lord: and all that is within me praise His holy name. 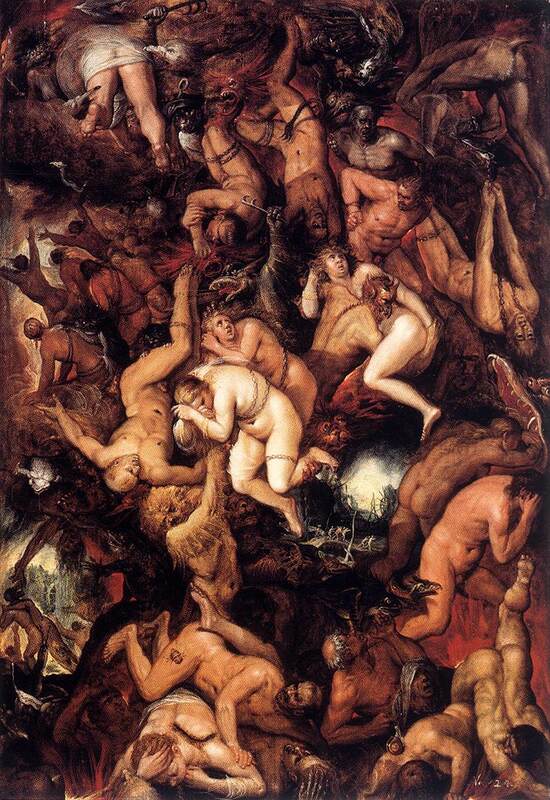 Wenceslaus was the son of a Christian Duke of Bohemia, but his mother was a hard and cruel pagan. Through the care of his holy grandmother, Ludmilla, herself a martyr, Wenceslaus was educated in the true faith, and imbibed a special devotion to the Blessed Sacrament. 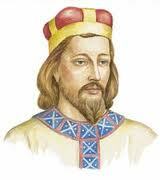 On the death of his father, his mother, Drahomira, usurped the government and passed a series of persecuting laws. In the interests of the Faith Wencesluas claimed and obtained, through the support of the people, a large portion of the country as his own kingdom. His mother secured the apostasy and alliance of her second son, Boleslas, who became henceforth her ally against the Christians. Wenceslaus meanwhile ruled as a brave and pious king, provided for all the needs of his people, and when his kingdom was attacked, overcame in single combat, by the sign of the cross, the leader of an invading army. 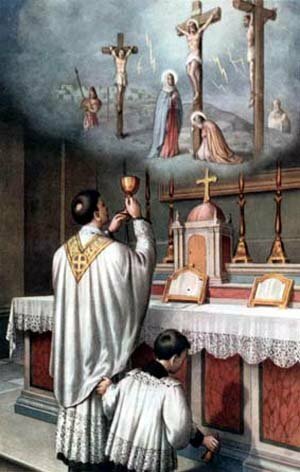 In the service of God he was most constant, and planted with his own hands the wheat and grapes for the Holy Mass, at which he never failed daily to assist. His piety was the occasion of his death. Once, after a banquet at his brother’s palace, to which he had been treacherously invited, he went, as was his wont at night, to pray before the tabernacle. 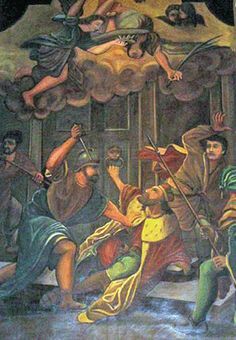 There, at midnight on the feast of the Angels, A.D. 938, he received his crown of martyrdom, his brother dealing him the death-blow. St. Wenceslaus teaches us that the safest place to meet the trials of life, or to prepare for the stroke of death, is before Jesus in the Blessed Sacrament. In virtúte tua, Dómine, lætábitur justus: et super salutáre tuum exsultábit veheménter: desidérium ánimæ ejus tribuísti ei. Ps. Quóniam prævenísti eum in benedictiónibus dulcédinis: posuísti in cápite ejus corónam de lápide pretióso. Gloria Patri. In Thy strength, O Lord, the just man shall joy: and in Thy salvation he shall rejoice exceedingly: Thou hast given him his heart’s desire. Ps. For Thou hast prevented him with blessings of sweetness; Thou hast set on his head a crown of precious stones. Glory be to the Father. O God, Who, through the palm of martyrdom, didst transfer blessed Wenceslaus from an earthly principality to Heavenly glory: keep us, by his prayers, from all adversity, and grant us to rejoice in his fellowship. Through our Lord. The Lord conducted the just through the right ways, and showed him the kingdom of God, and gave him the knowledge of the holy things; made him honourable in his labours, and accomplished his labours. In the deceit of them that overreached him, He stood by him, and made him honourable. He kept him safe from his enemies, and defended him from seducers, and gave him a strong conflict, that he might overcome, and know that wisdom is mightier than all. She forsook not the just when he was sold, but delivered him from sinners: she went down with him into the pit, and in bands she left him not, till she brought him the sceptre of the kingdom and power against those that oppressed him; and showed them to be liars that had accused him: and the Lord our God gave him everlasting glory. Blessed is the man that feareth the Lord; he delighteth exceedingly in His commandments. His seed shall be mighty upon earth: the generation of the righteous shall be blessed. Alleluia, alleluia. 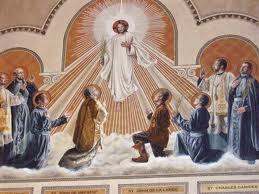 O Lord, Thou hast set on his head a crown of precious stones. Alleluia. At that time, Jesus said to His disciples: Do not think that I came to send peace upon earth: I came not to send peace, but the sword. For I came to set a man at variance against his father, and the daughter against her mother, and the daughter-in-law against her mother-in-law: and a man’s enemies shall be they of his own household. He that loveth father or mother more than Me, is not worthy of Me; and he that loveth son or daughter more than Me, is not worthy of Me; and he that taketh not up his cross, and followeth Me, is not worthy of Me. He that findeth his life, shall lose it: and he that shall lose his life for Me, shall find it. He that receiveth you, receiveth Me; and he that receiveth Me, receiveth Him that sent Me. He that receiveth a prophet in the name of a prophet, shall receive the reward of a prophet; and he that receiveth a just man in the name of a just man, shall receive the reward of a just man. And whosoever shall give to drink to one of these little ones a cup of cold water in the name of a disciple, amen I say to you, he shall not lose his reward. Thou hast crowned him with glory, and honor; and hast set him over the works of Thy hands, O Lord. Accept, we beseech Thee, O Lord, our offerings and prayers; both cleanse us by these Heavenly mysteries and graciously hear us. Through our Lord. 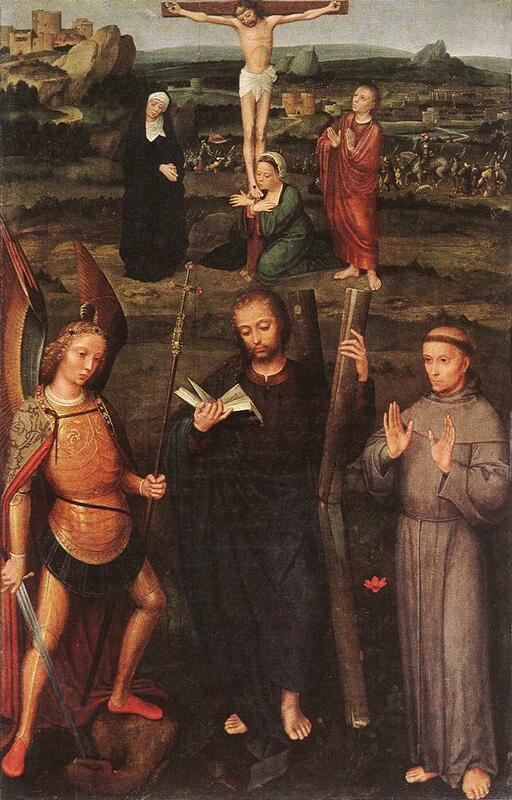 Grant, we beseech Thee, O Lord, our God, that we, who in this life joyfully assist in the commemoration of Thy Saints, may hereafter rejoice in beholding them forever in Heaven. Through our Lord. Ss. Cosmas and Damian were brothers, and born in Arabia, but studied the sciences in Syria, and became eminent for their skill in physic. Being Christians, and full of that holy temper of charity in which the spirit of our divine religion consists, they practiced their profession with great application and wonderful success, but never took any fee. They were loved and. respected by the people on account of the good offices received from their charity, and for their zeal for the Christian faith, which they took every opportunity to propagate. When the persecution of Diocletian began to rage, it was impossible for persons of so distinguished a character to lie concealed. They were therefore apprehended by the order of Lysias, Governor of Cilicia, and after various torments were bound hand and foot and thrown into the sea. We may sanctify our labor or industry, if actuated by the motive of charity toward others, even whilst we fulﬁll the obligation we owe to ourselves and our families of procuring an honest and necessary subsistence, which of itself is no less noble a virtue, if founded in motives equally pure and perfect. 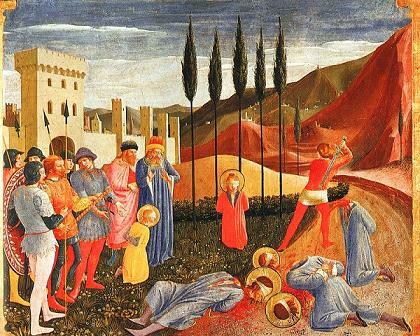 Oh glorious martyrs of Christ, Saints Cosmas and Damian, you gave your lives for the love of God, benefiting your fellow man, and crowning your martyrdom with an open and loyal profession of your faith. You taught us to love God above all things, and to love our fellow man as ourselves, professing always, and without fear, the religion of Jesus. Augmenting amongst the faithful populace many miracles, you are glorious indeed. Through your intercession, which brings about deliverance of these miracles, we pray to you for your aid in all things. May your patronage never be far from us in the illness of our body and soul. Oh great protectors, Saints Cosmas and Damian, assist us with your love and free us from all evils. Amen. Sapientiam sanctórum narrent pópuli, et laudes eórum núntiet Ecclésia: nómina autem eórum vivent in sæculum, sæculi. Ps. Exsultáte, justi, in Dómino: rectos decet collaudátio. Gloria Patri. Let the people show forth the wisdom of the saints, and the church declare their praise; and their names shall live unto generation and generation. Ps. Rejoice in the Lord, ye just: praise becometh the upright. Glory be to the Father. 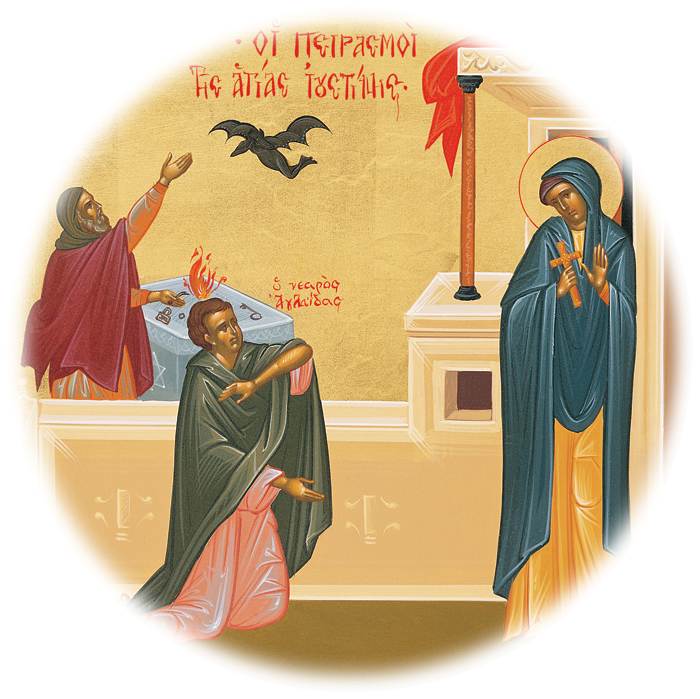 Grant, we beseech Thee, O almighty God, that we who celebrate the feast day of Thy holy Martyrs, Cosmas and Damian, by their intercession may be delivered from all dangers that threaten us. Through our Lord. But the just shall live for evermore, and their reward is with the Lord, and the care of them with the Most High. Therefore shall they receive a kingdom of glory, and a crown of beauty at the hand of the Lord: for with His right hand He will cover them, and with His holy arm He will defend them; and His zeal will take armour, and He will arm the creature for the revenge of His enemies. He will put on justice as a breastplate, and will take true judgment instead of a helmet; He will take equity for an invincible shield. The just cried, and the Lord heard them: and delivered them out of all their troubles. The Lord is nigh unto those who are troubled in heart, and the humble in spirit shall be saved. Alleluia, alleluia. This is the true brotherhood that overcometh the wickedness of the world; it hath followed Christ, holding fast to the glorious heavenly kingdom. Ecce merces vestra multa est in caelo. Behold, your reward is very great in heaven. At that time, Jesus coming down from the mountain stood in a plain place, and the company of His disciples, and a very great multitude of people from all Judea and Jerusalem, and the seacoast both of Tyre and Sidon, who were come to hear Him, and to be healed of their diseases. And they that were troubled with unclean spirits were cured. And all the multitude sought to touch Him, for virtue went out from Him, and healed all. And He, lifting up his eyes on His disciples, said, Blessed are ye poor: for yours is the kingdom of God. Blessed are ye that hunger now: for you shall be filled. Blessed are ye that weep now: for you shall laugh. Blessed shall you be when men shall hate you, and when they shall separate you, and shall reproach you, and cast out your name as evil, for the Son of man’s sake. Be glad in that day and rejoice, for behold, your reward is great in Heaven. All they that love Thy name shall glory in Thee: for Thou, O Lord, wilt bless the just: O Lord, Thou hast crowned us with the shield of Thy good will. May the loving prayers of Thy Saints not be wanting to us, O Lord, to win us Thy gifts and ever to obtain us Thy pardon. Through our Lord. They have given the dead bodies of Thy servants, O Lord, to be meat for the fowls of the air, the flesh of Thy saints to the beasts of the earth: according to the greatness of Thy arm take possession of the children of them that have been punished by death. May Thy people, we beseech Thee, O Lord, be protected by the privilege of participation in the heavenly banquet and by the prayer of the saints made in their behalf. Through our Lord. The eight North American Martyrs (1642-1649) were six priests and two lay brothers. They were heroic members of the Society of Jesus who were martyred in North America to bring the Faith that is necessary for salvation to the Huron, the Iroquois and the Mohawk Indians. Five of the eight North American martyrs were put to death in what is now Canada, and three of them in New York State. There is a shrine to the United States’ martyrs at Auriesville in New York. There is a shrine to the Canadian martyrs at Fort Saint Mary near Midland, Ontario. 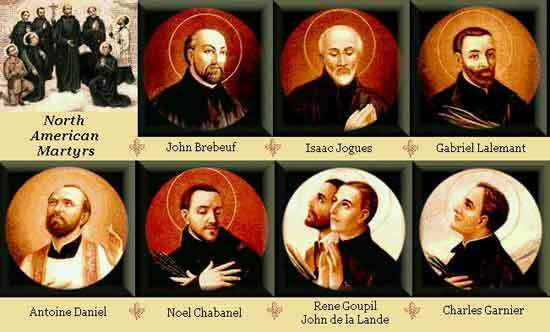 They are Saint Rene Goupil, a lay brother martyred in 1642 in New York State; Saint Isaac Jogues, a priest, and Saint John de Lalande, a lay brother, martyred in 1646 in New York State; Saint Anthony Daniel, a priest, martyred in Canada in 1648; Saint John de Brebeuf, Saint Charles Garnier, Saint Noel Chabanel and Saint Gabriel Lalemant, all priests, and all martyred in Canada in 1649. 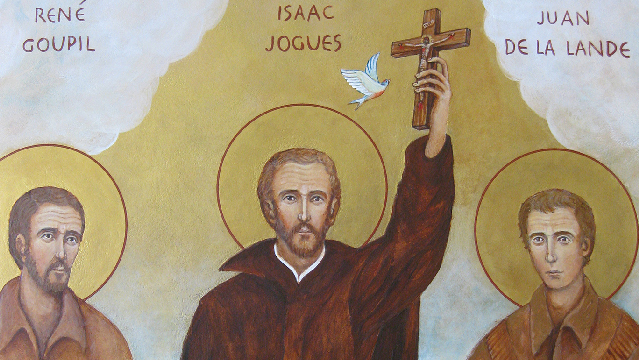 Saint Isaac Jogues, after thirteen months’ imprisonment by the Mohawks, had several fingers cut off his hand. He went back to Europe, but returned again to North America and was killed by tomahawk blows at Ossernenon, now called Auriesville, in New York State. 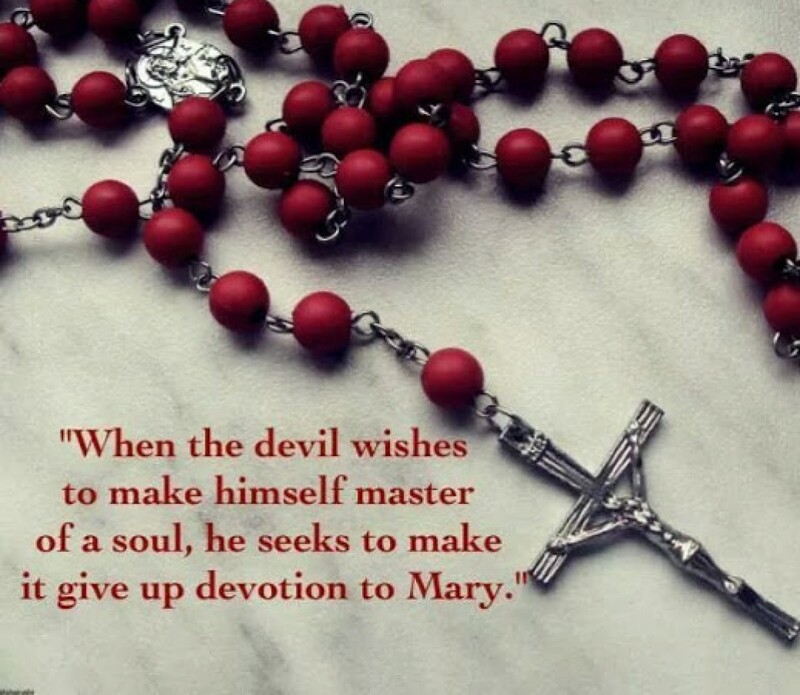 Saint John de Brebeuf declared before he died, “I have a strong desire to suffer for Jesus Christ.” He was tortured terribly, and a burning torch was put into his mouth, which strangled him. Saint René Goupil said, “Jesus, Jesus, Jesus!” as he died. This is also the feast of Saints Cyprian and Justina, Martyrs and there is a commemoration at Holy Mass for these holy martyrs. St. Cyprian was converted to the Christian Faith by the holy virgin St. Justina, and with her suffered martyrdom. They were both beheaded in the year 304 at Nicomedia, the residence of Emperor Diocletian. Devotion to Sts. 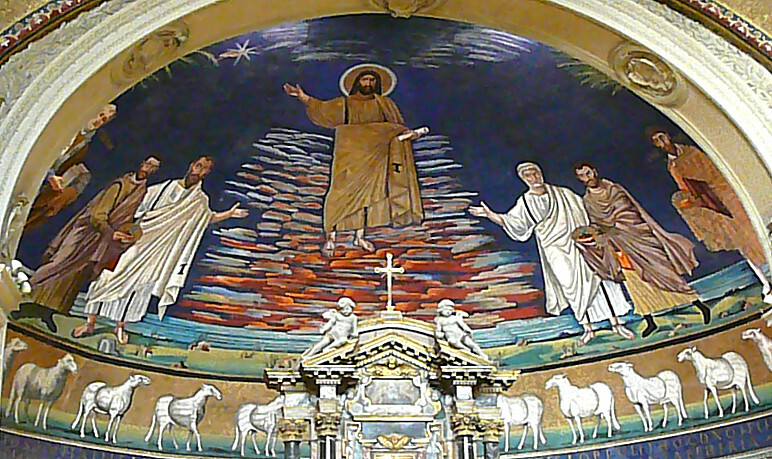 Cyprian and Justina, was introduced into Rome during the Middle Ages, when tradition asserted that their relics were preserved near the Lateran Basilica. Hi sunt qui venérunt de tribulatióne magna, et lavérunt stolas suas, et dealbavérunt eas in sánguine Agni. Ps. 11: 1 Laudáte Dóminum, omnes gentes; laudáte eum omnes pópuli. Gloria Patri et Filio et Spiritui Sancti sicut erat in principio et nunc, et semper, et saecula saeculorum. Amen. O praise the Lord, all ye nations; praise Him, all ye people. Glory be to the Father and to the Son and to the Holy Ghost, as it was in the beginning, is now and ever shall be, world without end. Amen. 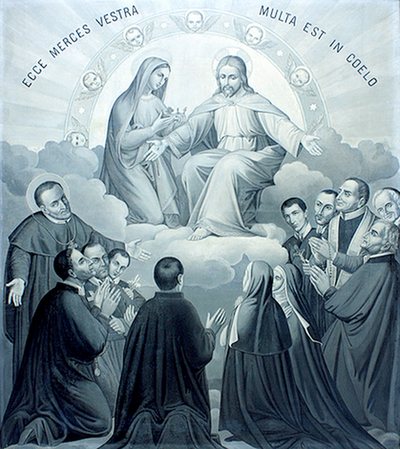 O God, Who didst consecrate the first-fruits of the faith in the northern regions of America by the preaching and blood of Thy blessed Martyrs Isaac, John, and their Companions: vouchsafe unto us, we beseech Thee, that through their intercession the fruitful harvest of Christians may everywhere daily receive an increase. Through our Lord Jesus Christ, Thy Son, Who livest and reignest with Thee in the unity of the Holy Ghost, one God. Let us pray. May the continual protection of the blessed martyrs, Cyprian and Justina, comfort us, O Lord; for Thou dost not cease to behold with favor those whom Thou hast granted the grace of such assistance. Through the same Lord Jesus Christ, Thy Son, Who liveth and reigneth with Thee in the unity of the Holy Ghost, one God Forever and ever. R.Amen. Lesson from the Epistle of blessed Paul the Apostle to the Corinthians. Brethren; I ought to have been commended by you: for I have no way come short of them that are above measure apostles, although I be nothing. Yet the signs of my apostleship have been wrought on you, in all patience, in signs, in wonders, and mighty deeds. For what is there that you have had less than the other churches, but that I myself was not burdensome to you? Pardon me this injury. Behold now the third time I am ready to come to you; and I will not be burdensome, unto you. For I seek not the things that are yours, but you. For neither ought the children to lay up for the parents, but the parents for the children. But I most gladly will spend and be spent myself for your souls; although loving you more, I be loved less. Our soul hath been delivered, as a sparrow, out of the snare of the fowlers. The snare is broken, and we are delivered: our help is in the name of the Lord, Who made Heaven and earth. Alleluia, alleluia. As the sufferings of Christ abound in us, so also by Christ doth our comfort abound. Alleluia. As gold in the furnace He hath proved them, and as a victim of a holocaust He hath received them. 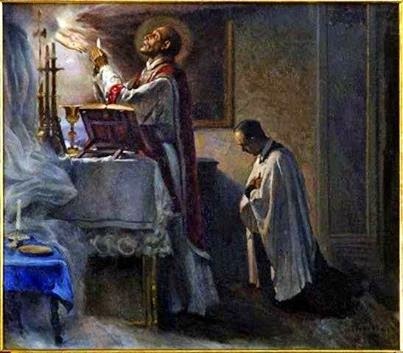 O Lord, grant that we may offer to Thee with pure minds the immaculate Host which a spotless purity of life and continual desire for mortification rendered to Thy blessed Martyrs a most delightful banquet. Through our Lord Jesus Christ, Thy Son, Who liveth and reigneth with Thee in the unity of the Holy Ghost, one God. 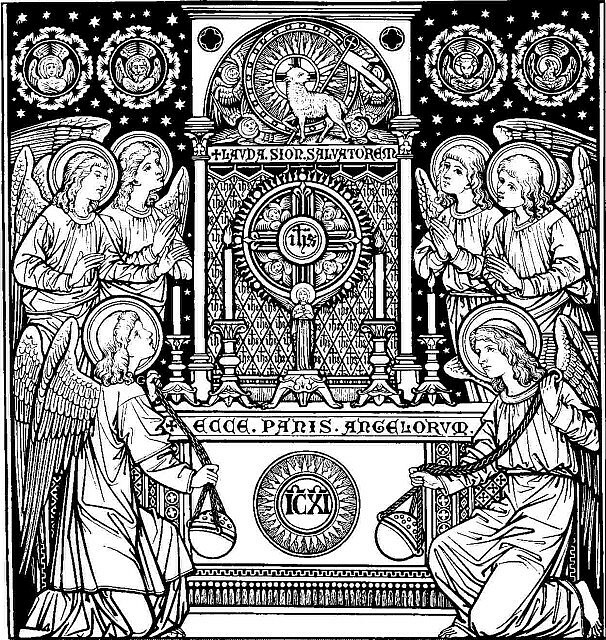 We offer Thee, O Lord, the gifts of our devotion; may they, through Thy mercy, be rendered both pleasing unto Thee, for the honor of Thy just ones, and profitable for our salvation. Through our Lord Jesus Christ Thy Son our Lord, Who liveth and reigneth with Thee in the unity of the Holy Ghost, one God. Christ shall be magnified in my body, whether it be by life or by death: for to me, to live is Christ, and to die is gain. Refreshed by the Bread of the strong, grant unto us, O almighty God, that as Thy blessed martyrs Isaac, John, and their Companions, strengthened by it, did not hesitate to give their lives for their brethren; so may we also, bearing one another’s burdens, love our neighbors in deed and in truth. Through our Lord Jesus Christ, Thy Son, Who liveth and reigneth with Thee in the unity of the Holy Ghost, one God Forever and ever. Let us pray. Grant us, we beseech Thee, O Lord, by the intercession of Thy holy martyrs, Cyprian and Justina that what we touch with our lips we may receive with a pure heart. Through the Lord Jesus Christ, Thy Son, Who liveth and reigneth with Thee in the unity of the Holy Ghost, one God. How camest thou in hither not having on a wedding garment? Salus pópuli ego sum, dicit Dóminus: de quacúmque tribulatióne clamáverint ad me, exáudiam eos: et ero illórum Dóminus in perpétuum. Ps. Atténdite, pópule meus, legem meam: inclinàte aurem vestram in verba oris mei. Glória Patri. I am the salvation of the people, saith the Lord: in whatever tribulation they shall cry to Me, I will hear them; and I will be their Lord for ever. Ps. Attend, O My people, to My law; incline your ears to the words of My mouth. Glory be to the Father. Almighty and merciful God, in Thy goodness keep us, we beseech Thee, from all things hurtful; that we, being ready both in body and soul, may accomplish those things which belong to Thy service. Through our Lord. Brethren: Be ye renewed in the spirit of your mind, and put on the new man, who according to God is created in justice and holiness of truth. Wherefore, putting away lying, speak ye the truth every man with his neighbour, for we are members one of another. Be angry, and sin not. Let not the sun go down upon your anger. Give not place to the devil. He that stole, let him now steal no more: but rather let him labour, working with his hands the thing which is good, that he may have something to give to him that suffereth need. Let my prayer be directed as incense in Thy sight, O Lord. The lifting up of my hands as evening sacrifice. Alleluia, alleluia. Give glory to the Lord, and call upon His name: declare His deeds among the nations. Alleluia. 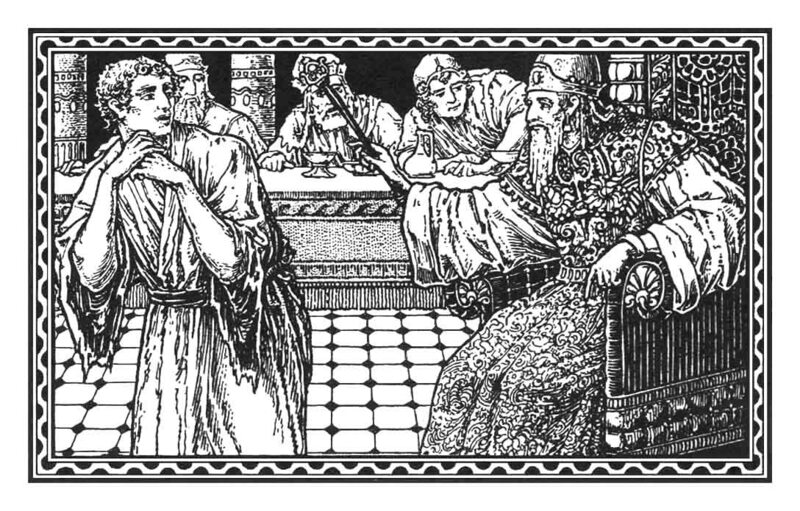 At that time: Jesus spoke to the chief priests and the Pharisees in parables, saying: The kingdom of heaven is likened to a king, who made a marriage for his son; and he sent his servants, to call them that were invited to the marriage, and they would not come. Again he sent other servants, saying: Tell them that were invited: Behold, I have prepared my dinner; my beeves and fatlings are killed, and all things are ready; come ye to the marriage. But they neglected: and went their ways, one to his farm, and another to his merchandise; and the rest laid hands on his servants, and having treated them contumeliously, put them to death. But when the king had heard of it, he was angry; and sending his armies, he destroyed those murderers, and burnt their city. Then he saith to his servants: The marriage indeed is ready, but they that were invited were not worthy. Go ye therefore into the highways, and as many as you shall find, call to the marriage. And his servants going forth into the ways, gathered together all that they found, both bad and good; and the marriage was filled with guests. And the king went in to see the guests; and he saw there a man who had not a wedding garment: and he saith to him: Friend, how camest thou in hither, not having on a wedding garment? but he was silent. Then the king said to the waiters: Bind his hands and feet, and cast him into the exterior darkness: there shall be weeping and gnashing of teeth. For many are called, but few are chosen. If I shall walk in the midst of tribulation, Thou wilt quicken me, O Lord; and Thou wilt stretch forth Thy hand against the wrath of my enemies, and Thy right hand shall save me. Grant, we beseech Thee, O Lord, that these gifts, which we offer in the sight of Thy majesty, may be unto us for salvation. Through our Lord. Sanctus, Sanctus, Sanctus, Dominus Deus Sabaoth. Pleni sunt coeli et terra gloria Tua. Hosanna in excelsis. Benedictus qui venit in nómine Domini. Hosanna in excelsis. Thou hast commanded Thy commandments to be kept most diligently: O that my ways may be directed to keep Thy justifications. May the healing power of Thy grace, O Lord, mercifully rid us of all perversity of heart, and make us ever cleave to Thy commandments. Through the same Lord. 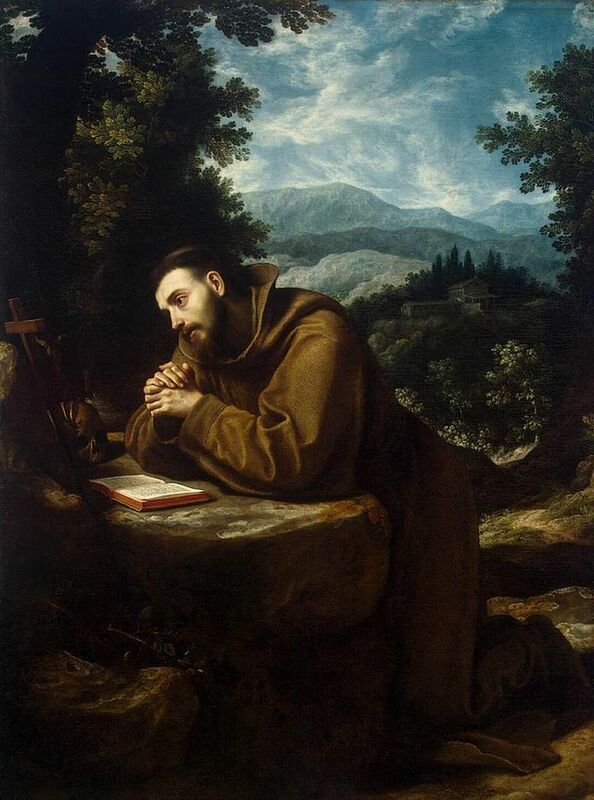 Glorious Saint Francis, who voluntarily renounced all the comforts and riches of your home to follow more perfectly the life of poverty of Jesus Christ: Obtain for us, we pray, a generous contempt of all things in this world, that we may secure the true and eternal things of heaven.